The #NotWithoutMe Accelerator is an innovative development programme which provides organisations the time, resources and support from peers and experts to develop their approaches to delivering digital inclusion projects with ‘vulnerable’ young people. 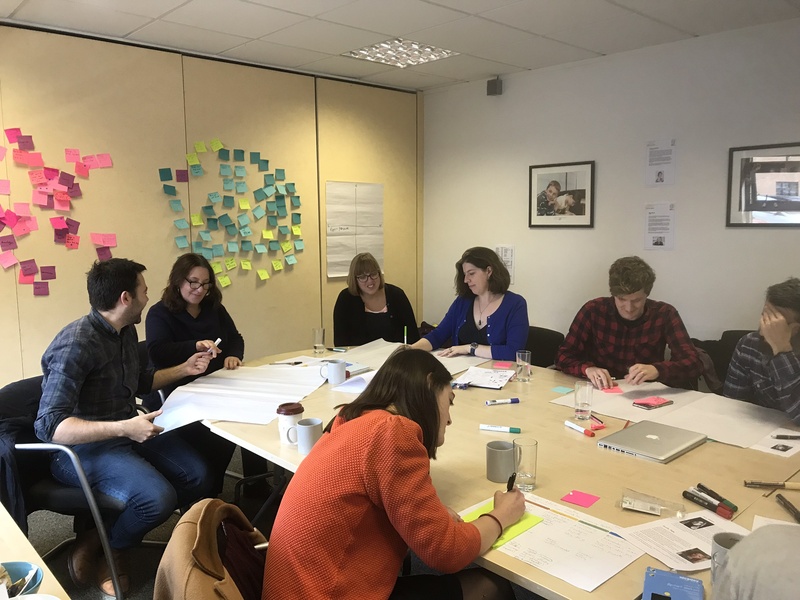 In our fifth #NotWithoutMe Accelerator blog, Charlotte Latimer from Tower Hamlets Young People’s Advice Centre (YPAC), shares insights from their journey on the #NotWithoutMe Accelerator and fifth workshop – ‘Telling Your Story’. On Friday 9th November the ‘Accelernauts’ met for the last #NotWithoutMe Accelerator workshop, ‘Telling your Story’, before the final pitch in Dunfermline on the 11th December. My story started back in April when Carnegie Associate, Cliff Manning, rang me to suggest that the Young People’s Advice Centre (YPAC) might be interested in getting involved with #NotWithoutMe. The programme was developed by the Carnegie UK Trust to challenge the idea that young people are digital natives and boost young people’s digital inclusion. YPAC works with young people 16 – 25 with special educational needs and disabilities in Tower Hamlets, and supports the Our Time All Ability Youth Forum, and Cliff thought it might be a good fit for the project. Unfortunately, the only time I had to complete the bid before the application deadline was during a trip away in Faro, Portugal. However, I had just got a phone upgrade and was able to make and send a short video explaining what we do and why we’d like to get involved. I sat in a hostel on the beach using apps and websites to complete the application and felt excited to be given an opportunity to empower the young people I work with using new digital technologies. In May, I was thrilled to find out that our service had been accepted on to the #NotWithoutMe Accelerator and I was going to get to travel to Manchester, Dublin and Dunfermline and take part in a series of innovative workshops with other professionals across the sector. After the excitement of our first workshop, and inaugural dinner in Manchester with #NotWithoutMe Chair, Douglas White, on the 11th July, I started to really explore what the digital barriers are for young people and what the solutions could be. I talked to young people in the Our Time All Ability Youth Forum about what they were worried about, but discovered there were so many aspects of digital life to consider, I didn’t know where to start. ‘Who can read my Facebook messages?’ One young person asked me, and I realised that even though there were opportunities, there were also risks, as young people didn’t always feel in control of their digital lives. The more I thought about it, the more confused I became. I needed to do more research, and this led me on a journey through the schools and college in Tower Hamlets, trying to figure out, what skills do young people have already, and what do they want and need. There was so much information to consider I wasn’t sure I was going to pull it all together into a project plan, but regular catch up calls with Cliff, and feedback from the monthly workshops’ ‘pitch and critique’ sessions, helped guide me through the process. The more young people I talked to, the more I started to understand digital is a huge, unescapable part of their lives that they vitally need the tools and skills to explore confidently and safely. The lightbulb moment came when seeing young people engaging in an activity about ‘Digital worries’ and realising the things they were most concerned about were getting a job, friends and bullying. The issues facing young people are the same online and offline, they just come in a different format. The #NotWithoutMe Accelerator has been a fantastic opportunity to learn from, and work with, some really inspiring people. The highlight of our last workshop together in Cardiff was ‘Bunny, bunny-ing’ and ‘tiki tiki-ing’ together in an activity that reminded me never to underestimate the power of breaking the ice, and warming up, when working in groups. I look forward to the next phase of the programme and all the possibilities the technological advancements in the 21st Century will open up for young people with special educational needs and disabilities. To find out more about the #NotWithoutMe Accelerator follow #NotWithoutMe on Twitter and you can also access our Padlet to see any resources recommended through the programme. Pac-man, houses, trees and nets made of bacon… What does your organisation look like?